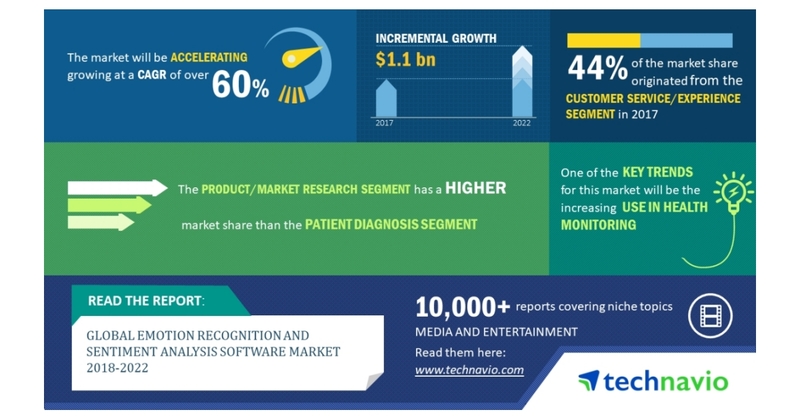 LONDON–(BUSINESS WIRE)–The global emotion recognition and sentiment analysis software market is expected to post a CAGR of over 60% during the period 2018-2022, according to the latest market research report by Technavio. A key factor driving the growth of the market is the growth of IoT. With the internet of things, one device can directly pass information to another device without any human intervention. For instance, Amazon’s Alexa, if operated with a smart camera, can recognize and identify a person’s face. If Alexa is connected to a smart camera, it can name the person standing in front of the camera based on past records and facial recognition. The technology can prevent strangers from gaining access to the houses. Therefore, the growth of such IoT applications will drive the growth of emotion recognition software. This market research report on the ‘Global Emotion Recognition and Sentiment Analysis Software Market 2018-2022’ also provides an analysis of the most important trends expected to impact the market outlook during the forecast period. Technavio classifies an emerging trend as a major factor that has the potential to significantly impact the market and contribute to its growth or decline. Emotion recognition and sentiment analysis software can work effectively in the healthcare sector. Using this software, healthcare service providers can avoid errors when treating or diagnosing a patient. Doctors use the software to diagnose patients from their behavioral attributes. With recent developments in healthcare, there are emotion-sensing detectors that can detect illness and enable doctors to save time and consequently, the life of patients. The software can be integrated with wearables for patient monitoring by doctors and caretakers 24/7 as well as in selecting the correct line of treatment and in communicating with patients. “Wearable devices have been developed that can track information and track the vital statistics of individuals. Emotion recognition wearables can also help visually impaired and autistic individuals understand the emotions of people they interact with. Such increasing functionalities of emotion recognition wearable will boost the growth of the global market,” says a senior analyst at Technavio for research on media and entertainment services. This market research report segments the global emotion recognition and sentiment analysis software market by application (customer service/experience, product/market research, patient diagnosis, others) and geographical regions (APAC, EMEA, and the Americas). In 2017, the customer service/experience segment dominated the global emotion recognition and sentiment analysis software market and accounted for a 44% share followed by the product/market research segment and the patient diagnosis and others segments respectively. The others segment includes automotive, education, gaming, and monitoring and law enforcement, which have limited use for such software. The two leading segments are expected to witness a significant increase in their market share over the forecast period.